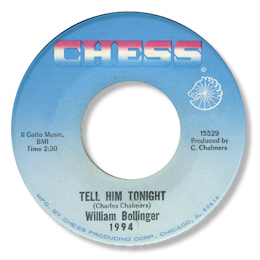 According to the excellent Memphis producer/horn man and background vocalist Charles Chalmers, Willie – or William – Bollinger came from Chicago. I’ve got no reason to doubt that beyond the name of the label his first 45 appeared on – Delaware. 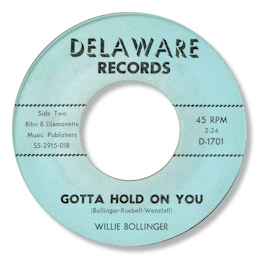 “Gotta Hold On” is a nice slab of easy paced Latin tinged R & B with Bollinger’s high baritone sounding mighty fine. In 1967 he was in Memphis recording tracks which Chalmers, who had very good contacts with the company, leased out to Chess. You Can Lead Your Woman To The Altar is a lovely song, well interpreted by Bollinger, who, it is claimed, was not a great artist to work in a studio with. The lovely guitarist on here is undoubtedly the wonderful Reggie Young. Perhaps even better was the other side Tell Him Tonight, a song Chalmers used a couple of times with the Climates, and Rudolph Taylor who shared the same instrumental track as Bollinger’s version. It’s probably superfluous to say that I love all three cuts. There were several unissued tracks from these sessions which the nice people at Ace have made available recently. They include the rather funky “People Are Talking” and a well judged uptempo “Is It Love”. The doo wop influenced “Teardrops” makes a good change of pace, but I think the best of the tracks that remained in the can is the beat ballad “I Don’t Have To Cry No More” thanks to it’s fine melody, good backing singers and a polished Bollinger vocal. 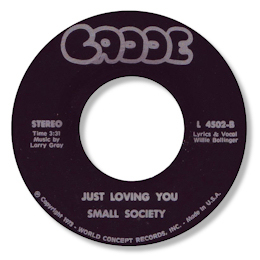 By the early 70s Bollinger was fronting a group called the Small Society, whose two 45s on Cadde are highly sought after. The only disappointing track on the singles is a version of “Groovin’”, all the others being worthwhile. “This Man” is a easy paced ballad on which Bollinger delivers one of his best performances. The similarly styled “Just Loving You” has the feel of a laid back West Coast soft rock ballad thanks to the strummed rhythm and gentle lead guitar. The uptempo “If You Stand By Me” has some “Can I Change My Mind” influences and is a dance floor favourite in some circles. Could the “Puzzletown Productions” on these discs indicate a Pennsylvania origin? UPDATE ~ I am delighted to say that Mr Bollinger's daughter, Leslie Bollinger-Morrow, has written with details of her fathers life. 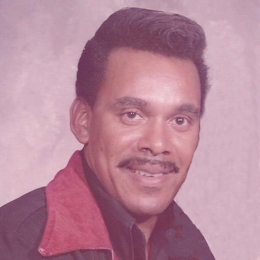 "My father was born March 8th 1933 in Cape Girardeau MO, to Pinkie Robinson Bollinger and Monroe Bollinger. He wasn't from Chicago and he was at Chess from 1959 to 1962. Then he Left with Charlie Chalmers for Memphis where he recorded under Sam Phillips at Sun records. Which is when he came home and met my mother. He was recording and performing until he passed away on may 24th 2003." 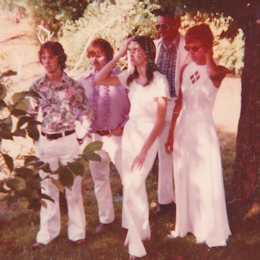 Leslie also provided the fantastic pictures of her father, and the Small Society. I'm very grateful to her. Note ~ You can find all of Bollinger’s Memphis recordings except “Tell Him Tonight” on the three Ace UK CDs devoted to the XL and Sounds Of Memphis labels.